As i already shout in the FOSDEM 2014 slides post, i have presented PhaROS in the last edition of FOSDEM, under the title of PhaROS: Towards Live Environments in Robotics. I bring now to you this video taken during the presentation. I wish you to enjoy it! Sorry if my hair is disheveled :), i am not very photogenic. As part of the PhaROS and related projects, Santiago Bragagnolo had developed TaksIt a framework for to ease handling concurrency. Expressing and managing concurrent computations is indeed a concern of importance to develop applications that scale. A robotic application often have different processes dealing with different activities (e.g. preception, planning, …). Posted in Pharo, PhaROS, RoboShop. PhaROS has being in this last edition of FOSDEM (2014) we are proud to share our time and space with a lot of open source projects. Thank you very much for good feelings, feedback and sharing this amazing time. Posted in Events, Pharo, PhaROS, RoboShop. We are now really glad to present an enhanced way to deal with PhaROS. Since we want to keep with the ROS community spirit of collaborative development for robotics, we introduce now our own command for managing packages made in PhaROS. This command is mean to install existing packages and create new packages with cool snippets and examples for going faster through the learning time. PhaROS tool is made completely in Pharo smalltalk and it allows to deploy an existent package into a pharo 1.4/2.0/3.0 in any distribution of ROS that uses catkin package. It automatize the generation xml, makefiles, type and scripts creation, going on the direction of letting the pharo programmer to focus just in programming and not in infrastructure stuff. Posted in News, Pharo, PhaROS. Building software for devices that cannot locally support development tools can be challenging. These devices have either limited computing power to run an IDE (e.g smartphones), lack appropriate input/output interfaces (display, keyboard, mouse) for programming (e.g mobile robots) or are simply unreachable for local development (e.g cloud servers). In these situations developers need appropriate infrastructure to remotely develop and debug applications. Yet remote debugging solutions can prove awkward to use due to their distributed nature. Empirical studies show us that on average 10.5 minutes per coding hour (over five 40-hour work weeks per year) are spend for re-deploying applications while fixing bugs or improving functionality. Moreover current solutions lack facilities that would otherwise be available in a local setting because its difficult to reproduce them remotely (e.g., object-centric debugging). This fact can impact the amount of experimentation during a remote debugging session – compared to a local setting. In this dissertation in order to overcome these issues we first identify four desirable properties that an ideal solution for remote debugging should exhibit, namely: interactiveness, instrumentation, distribution and security. Interactiveness is the ability of a remote debugging solution to incrementally update all parts of a remote application without losing the running context (i.e without stopping the application). Instrumentation is the ability of a debugging solution to alter the semantics of a running process in order to assist debugging. Distribution is the ability of a debugging solution to adapt its framework while debugging a remote target. Finally security refers to the availability of prerequisites for authentication and access restriction. Given these properties we propose Mercury, a remote debugging model and architecture for reflective OO languages. Mercury supports interactiveness through a mirror-based remote meta-level that is causally connected to its target, instrumentation through reflective intercession by reifying the underlying execution environment, distribution through an adaptable middleware and security by decomposing and authenticating access to reflective facilities. We validate our proposal through a prototype implementation in the Pharo programming language using a diverse experimental setting of multiple constraint devices. We exemplify remote debugging techniques supported by Mercury’s properties, such as remote agile debugging and remote object instrumentation and show how these can solve in practice the problems we have identified. but they differ only by values. In a discussion on the Pharo-dev mailing list, Laurent Laffont pointed what is done in PhpUnit and suggested to have something similar in Pharo. After a few hours hacking I’ve my parametrized tests working and integrated with the test runner to ease debugging. Since we have three arrays of parameters, we will have 3 different test cases all three with the same test selector, but each with a different parameters array. This is displayed by the test runner as shown in picture 1. I have changed the second and the third parameter arrays. 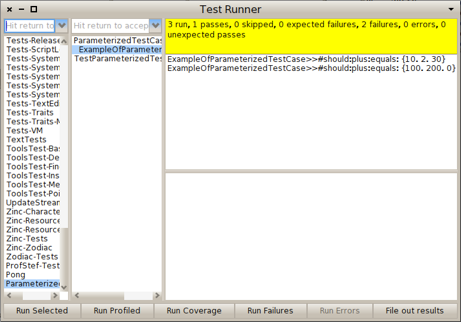 The Test Runner detects indeed 2 failing tests out of 3 runs as shown in picture 2. As you can see the parameters that lead to the defect are displayed so, one can identify the origin of the defect. 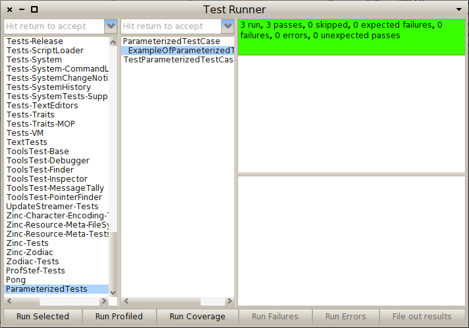 I have developed and tested parametrized tests under Pharo 2.0. If you want to try it, you can install it by evaluating the following expression in a workspace. It is worth noting that although in the examples I have given above data is hard coded, nothing prevent from adopting an approach as suggested by Frank Shearar in his Squeak Check project. Method that return the array of parameters can rely on any arbitrary complex data generator class, that may produce different data randomly each time tests are run.